My first experience with Takis was in college when a friend of mine introduced me to them one very late night after some libations (see how classy I am?) as well as this magical song. I hadn’t seen them again until recently when my roommate showed up with approximately four bags, and that’s when the addiction began again. One day, after making my famous homemade pickles, she had this fantastic idea to make Taki-crusted fried pickles. Obviously, she already knows that my regular fried pickles are delicious, so this was just the next step in the process of frying everything I can find. Plus I have a thing for putting my favorite things in one dish. The first step is to crush a bunch of Takis. Pour about two-thirds of a small bag into a sealable Ziploc bag and proceed to smash with all your might– it’s great fun if you’ve had a rough day. Make sure that you don’t leave any large pieces, as they won’t stick well to the pickle. 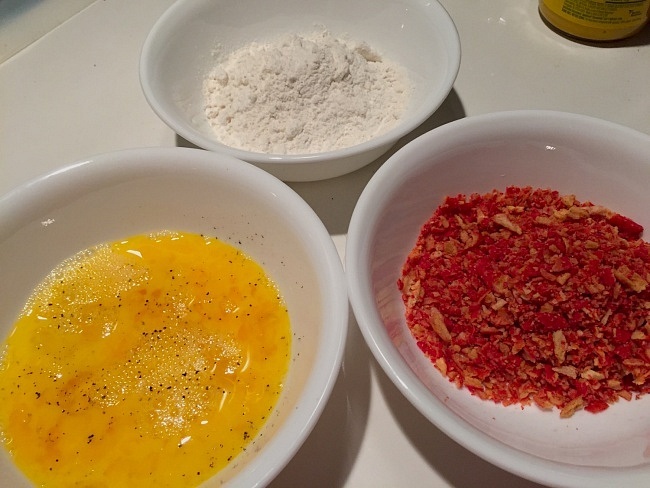 Pour out some flour into one bowl, a couple eggs into another bowl, and the crushed Takis in a third. Scramble up the eggs with some salt and pepper. I was using pickles I had already made so they were in spears, which is why I cut them in chunks. I think slices would have worked better, but the shape isn’t really that important. Heat up three-quarters of an inch of vegetable or canola oil in a frying pan, but make sure it’s not too hot. The best way to tell if oil is hot enough is to splash just a couple drops of water into the pan and see if you can hear a sizzle. Don’t stand too close or you might burn yourself (speaking from experience) and if you hear very loud popping sounds without any water being in the pan, it is most definitely too hot. 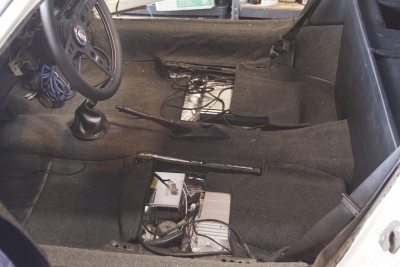 You’re better off keeping it on medium heat and just letting it take longer to heat up. 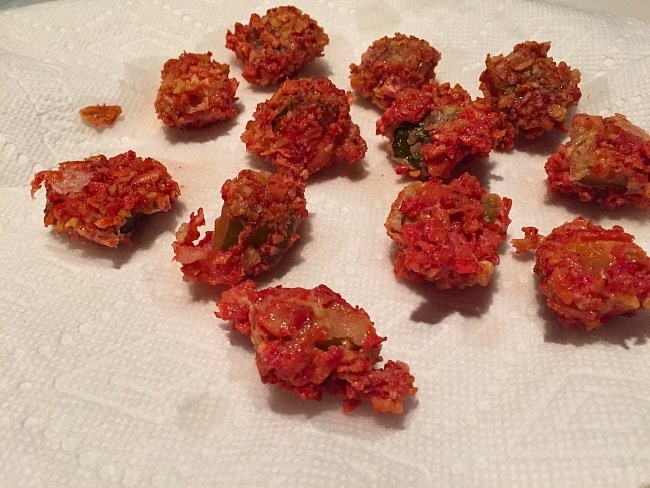 Take a piece of pickle (in whatever shape you choose), roll it in flour, then in egg (you’ll have to roll it around a couple times to get the egg to stick) and then in the Takis. 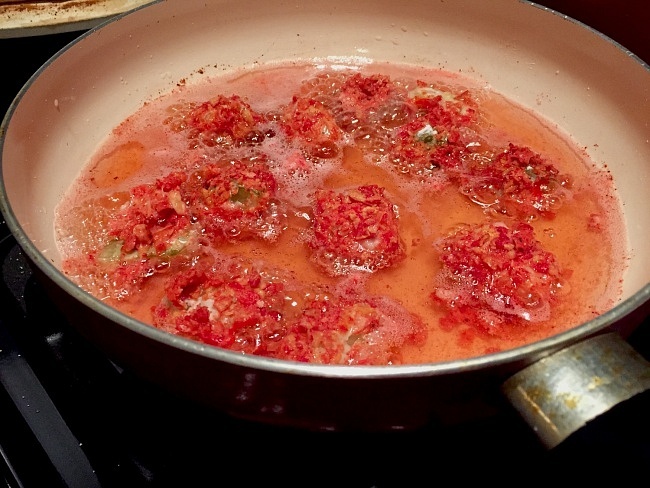 Press the Taki powder into the eggs so they adhere more firmly. Then gently place in the pan of oil, starting in the center and working your way out. Do this until you run out of pickles! Like anything else fried, you’ll know they’re done when the outside coating is firm and crunchy, so make sure to check the side of the pickle that is facing down in the pan. 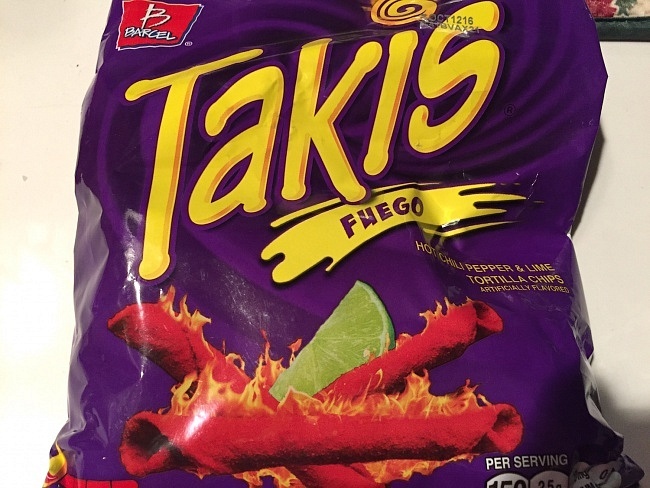 Takis are very red so it’s a little hard to tell if they’re done as they don’t really change color, but you might see them get a little brown. When they’re finished, gently take them out of the pan and place them on a paper towel-lined plate, or a brown paper grocery bag to soak up any remaining oil. I made my sriracha honey mustard to go with them (per the roommate’s request) which you can make using this recipe but they’re also good without sauce. Great for a game watch party or just a fun movie snack. Pour flour into one small bowl. Crush bag of Takis and pour into a second small bowl. Crack and scramble eggs, and mix in a sprinkle of salt and pepper. Heat ¾ inch of oil in a medium sized saute pan. 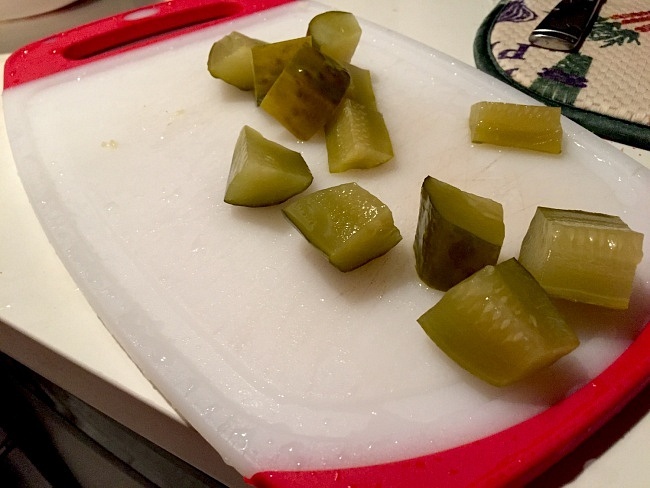 Cut or slice pickles into bite-sized pieces. 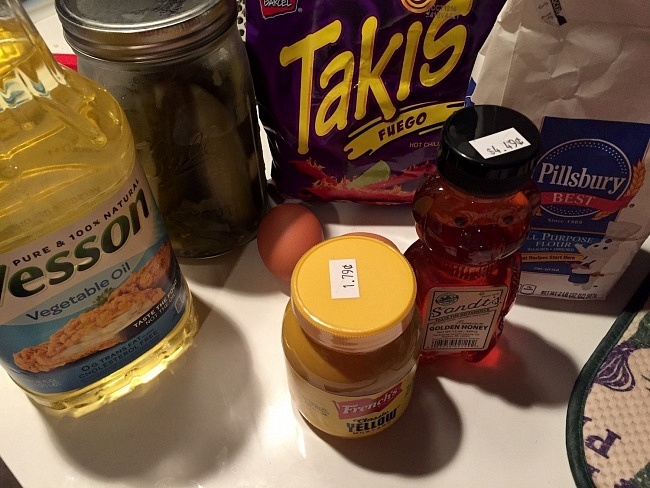 Roll pickles one at a time in flour, followed by egg mixture, and then in Takis until fully covered. Place pickles gently in hot oil, turning until firm and crunchy on the outside. Let cool on a paper towel-lined plate.